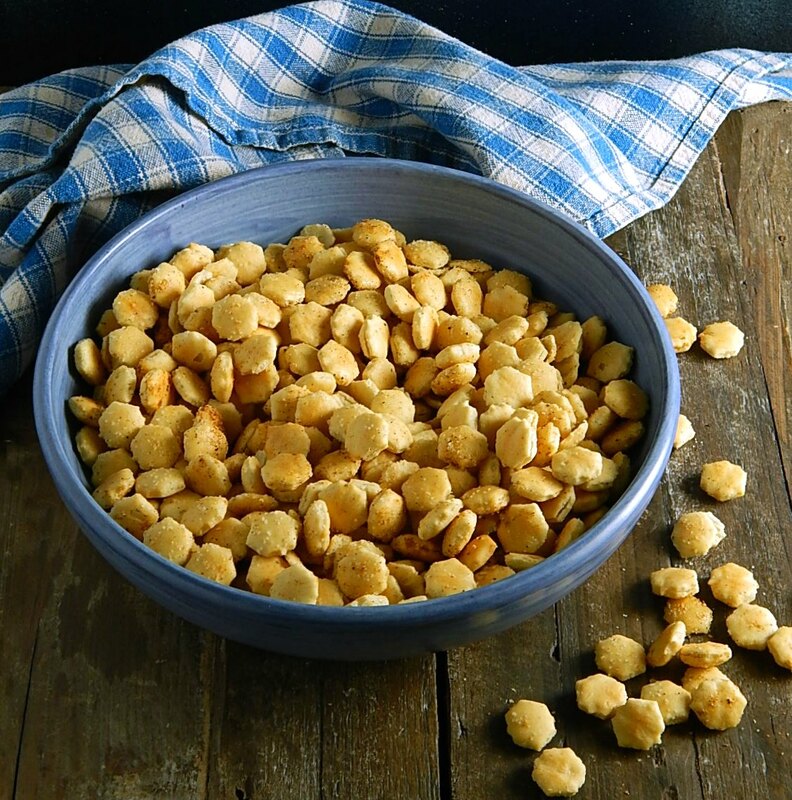 Old Bay Oyster Crackers would be a perfect addition to any party, even today, if you’re thinking about finding something last minute for the Superbowl. They’re super low effort and quick to whip out and absolutely addictive. How addictive? I just had to run out to get a few more from the kitchen. And it’s my third time! I consider myself lucky that I’ve just put a few in a small ramekin because if I would have brought out the bowl they’re in, I’d put a serious dent in it! If you’ve grown up around any coastal areas, you probably grew up with Old Bay Seasoning, and don’t think much of it beyond it’s delish on just about any kind of seafood you put it on. If you’ve never had Old Bay, you’re going to be surprised at all the big flavor. It’s a wild crash of flavor, a cacophony of spices. And it’s incredible on the Old Bay Oyster Crackers. Just use a light hand when adding in the spice so it’s not overwhelming. The Old Bay Oyster Crackers should have just enough seasoning to make you want to come back for more and not so much that you get tired of it. Just a hint of seasoning does the trick! Oyster crackers hold a special memory for me; we never had them at our house when I was a child, which is a little strange because my Grandma, my Mom’s Mom, always did. It seemed so special to have a bowl of soup at her house and sprinkle the little crackers over them! To this day, I think of my Grandma, Irene, every time I see Oyster Crackers. Now I’m wondering what my Grandma (or even my Mom) might think of the blow your mind flavor of Old Bay Oyster Crackers! I have a little secret, too. If you’re a fan of hot snacks, add in 1/4 to 1/2 teaspoon of cayenne and you’re going to have a fun adult snack with a good amount of heat. Yeah, you’re probably gonna want a beer or two if you do that, but isn’t that what parties are for? There really is nothing to making these little Old Bay Oyster Crackers. Put the Oyster Crackers in a bowl and drizzle them with melted butter or oil of your choice, sprinkle with the Old Bay Seasoning and toss. Add in cayenne if you want some heat. Just use an easy hand with the Old Bay. A teaspoon doesn’t seem like much but I think it’s just right, especially with a bit of cayenne added. You can up the amounts; just add the teaspoon and taste and if you want more spice, just add a little more and taste again. If you use butter, be sure to toss the crackers as you drizzle the butter; they can get soggy if you’re not careful; for some reason, if you use oil, it’s not as much of an issue. But either way, bake immediately after adding the oil/butter and spices; if you’re thinking about mixing ahead and then just heating through for a party, that’s no the way to go. But the Old Bay Oyster Crackers they can be eaten warm out of the oven or cold, and if they’re cold, they can be tossed back on the sheet tray and carefully reheated. Store after cooled, in an airtight container. This same recipe can easily be changed up with whatever spice blend you’d like to use. That’s going to give you just about unlimited possibilities in the flavor department and you’re only limited by your imagination. What flavors will you dream up? Sometimes you’ll need more than a teaspoon of a spice mix, depending on what flavors you’re working with. Taste and adjust and use your best judgment. I suspect the reason my Mom never served Oyster Crackers was that they are, ounce for ounce a little pricier than saltines and in my area at least, don’t go on sale with the other crackers. They really are the perfect little munchies but I have seen very similar recipes using saltine crackers. Of course, there’s no comparison to the cost of other snacks you might find in the junk food aisle; junk food can be incredibly pricey. If you don’t want to buy Old Bay Seasoning for the teaspoon or two that this recipe for Old Bay Oyster Crackers calls for, I get that. And I’ve suggested using my own Homemade Old Bay seasoning. Unless you keep a large variety of spices on hand, you might look at the long list of spices and roll your eyes! I get that, too! If that’s the case, use what you do have; the Old Bay Oyster Crackers will still be delish even if a spice or two is missing. It might be just a bit different than the actual Old Bay Seasoning but it will still be good. Preheat oven to 200 degrees F. Line a large sheet tray with foil for easy cleanup. Open oyster crackers and put in a bowl, drizzle with melted butter or olive oil, tossing gently as you drizzle. Sprinkle with Old Bay Seasoning and cayenne, if using. Start with the smaller amounts, taste and adjust. Bake for a total of 20 minutes, stirring after 10. Serve warm or room temperature. Store after cooled in an airtight container. I’ll be sharing Old Bay Oyster Crackers at Fiesta Friday #261 co-hosted this week by Antonia @ Zoale.com and Julianna @ Foodie on Board. Stop by and visit Fiesta Friday and see what wonderful recipes have been posted this week. This entry was posted in Click here for Fabulous Food Posts and tagged Boston, crackers, New England, Old Bay Seasoning, oyster crackers. Bookmark the permalink. My pleasure! I think you can make these with any saltine, maybe use a bit more of the butter or oil and spice mix! I am just shakng my head at that old sage, lol!! These would be DANGEROUS anywhere near me. Looks excellent!!! Hi Kim! Same here. I keep putting a few at a time in small little cups because I’m afraid if I grabbed the bowl I’d scarf it down in minutes! Thanks! And I get that texture thing. I think the bacon wrapped around saves it because it’s enveloped in crunchiness! I almost had crackers for breakfast but pulled off some self control, lol! I ate a whole bag of Ruffles Loaded Chips yesterday for supper yesterday, along with the rest of a vanilla cake for one. You must be reacting to the weather! I know my body wants to eat and then hibernate, lol!! I will be by soon. I love your little cakes you’ve done and your ice-cream, and well, just about everything!! I made hummus dip today for … veggies. Yeah, that’s the ticket. Veggies. I had it on toasted sourdough. I made 2 cups with 1 can of chickpeas. One cup in the freezer, one for snacking. Definitely have to make these! Love the homemade Old Bay seasoning recipe, because we don’t use it often. Me either, and i hate to buy something I think will just sit there for years until I toss it out! Mollie oh golly these look good. There’s only a dozen or so food items that are hard to find here and your Old Bay Oyster Crackers include two. No oyster crackers here, plenty of crispbread though and Old Bay spice not around. But, with you Old Bay copycat recipe I’m good to go there. Hum, I thinking copycat Old Bay Swedish crisp bread. What do you think? I think that sounds marvelous!! When should I be there, lol?! !